What is Honor Before Victory? 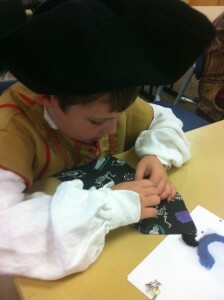 Alexander in his pirate garb! 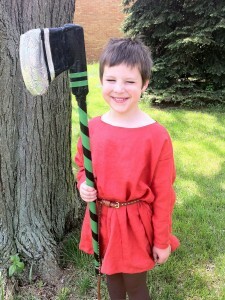 Garb (Clothing) — Dressing in medieval and renaissance-styled clothing is one of the best ways for your child to get into the mindset of “historical recreation.” I urge you not to make the mistake of thinking they won’t want to “dress up” or “they’re just kids, no one will care.” A simple tunic works for both girls and boys, and is easy and inexpensive to make — the tunic can go right over their normal clothes for convenience and comfort. If you’re interested in costuming, get your kids involved in choosing clothing they’ll enjoy wearing and picking out colors and fabrics. When I asked my son what he might like to wear if he were “in the old days,” he answered, “a pirate!” So together we settled on Elizabethan-era clothing of a doublet and breeches. 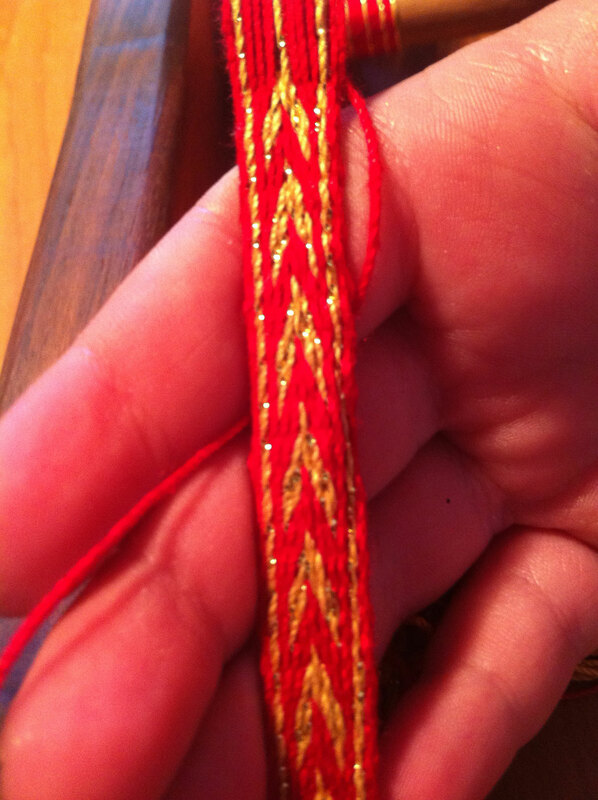 He picked out the materials and even created the trim with tablet weaving (a new craft to learn!). He wears his garb with pride, and looks amazing! Garb Tip #1: I made my son’s garb a little big, so he’s still able to wear it a year later and I estimate he still has a couple more years left before he outgrows it and we pass it on to a younger member. 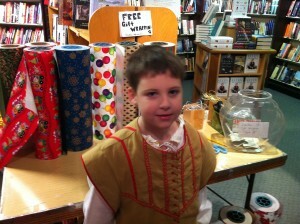 Garb Tip #2: You don’t have to have lots of outfits for kids — you’ll notice Alexander wears his gold doublet in most of his photos. Kids are generally content to wear the same garb to events, and may take comfort in familiarity of it. Just be sure you can wash their garb in some manner, as kids get dirty! 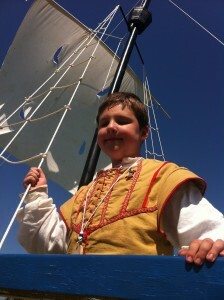 My son’s doublet isn’t machine washable, but the white shirt he wears is … and I wash it a lot! 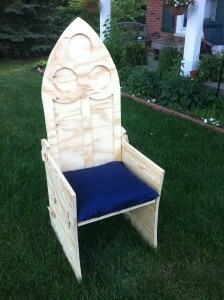 Arts & Crafts — I don’t know about your kids, but my son ADORES arts and crafts. And the SCA is the perfect place to learn and try new crafts because we’re all researching and trying out handicrafts of all types. Many events will offer crafts for kids to do — things my son has made in just the last six months include a wooden pirate ship, an ornament, a leather pouch, marbled paper, cookies, spinning top, hammered copper, beaded favors, heraldic devices, and a working catapult! Check the Children’s Activities on an event’s schedule to find out what might be available. You can also do historical arts and crafts right in your home or local group — good projects for children include painting, tablet weaving, cooking, and embroidery. Kids may even be able to enter some arts & sciences displays and competitions, including the Youth Craftmens Faire and Prize Tourney in the spring and fall. Craft Tip #1: If you’re going to an event without formal kids activities, bring along a craft box with historical crafts. I like to keep a craft box filled with clay, beads, and period games (such as pick-up sticks), all of which are easily obtainable at stores. Martial Arts — SCA “combat” is considered a Western martial art, and youths ages 6-17 can get involved in what’s called “boffer” combat. Boffers are padded lengths of PVC plastic with handles, allowing kids to learn combat techniques without being harmed. Kids have armor requirements like the adults, though their rules differ and less armor is required. You can get inexpensive armor by purchasing things like street hockey helmets from a used sporting goods store. If you’re interested in youth combat, ask your group’s Knight Marshall about how to get in touch with a Youth Combat Marshall and start learning! Archery — The Disney/Pixar “Brave” movie (summer 2012) brings a resurgence in kids’ interest in archery, and the SCA is a particularly good place to learn youth archery. A number of events encourage youth archery, which has an even lower barrier to entry than youth combat. Service — A big aspect of being a member of the SCA is giving back to the community, and kids are encouraged to participate as well. Depending on their age, children can assist in group service and crafting projects, help retain for royalty and barons/baronesses, teach classes on arts and crafts they enjoy, and help other children feel welcome at meetings, practices, and events. My son, who is 7 at the time I’m writing this article, has done each of these things as proud member of the Barony of Cynnabar, from simply helping to keep a water cup full for someone who is otherwise occupied and painting shields for an upcoming war to teaching an embroidery class and folding brochures (and encouraging other kids into helping him fold said brochures). 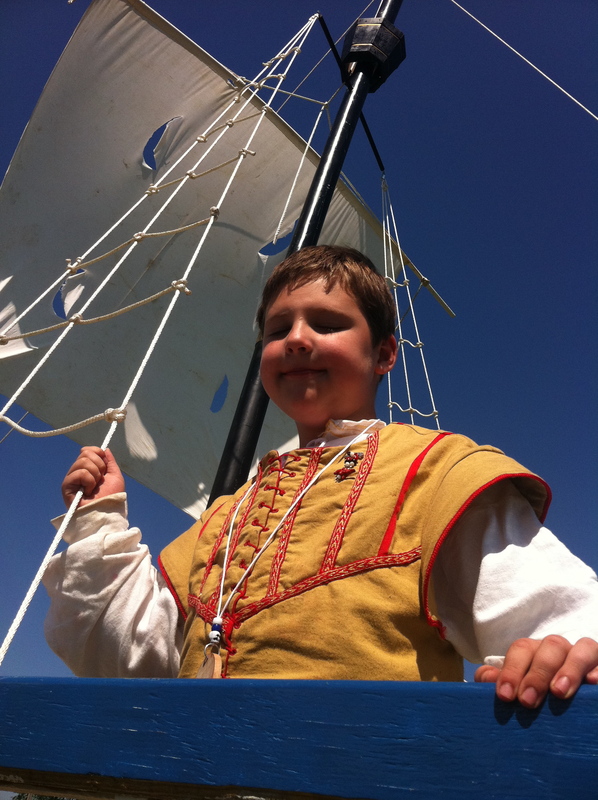 Your Kingdom may also offer a Page School to help develop leadership skills and promote the skills and knowledge of the Middle Ages, which is a fun (and recognizable) way for kids to contribute. It’s important to note that there are responsibilities on the part of both the parents and the kids, but I consider them all basic common sense. Parents are responsible for the supervision, care, behavior, and well being of the children attending SCA activities at all times, minor waivers are required for minor children (they are available when you arrive at an event), etc. Children should only attend events with parental/guardian supervision, exhibit appropriate behavior at all times, and must be able to tell an adult their parent(s) SCA name, legal name, and where they can be found. Check with your Kingdom’s Minister of Youth for more details on their Youth Policy. 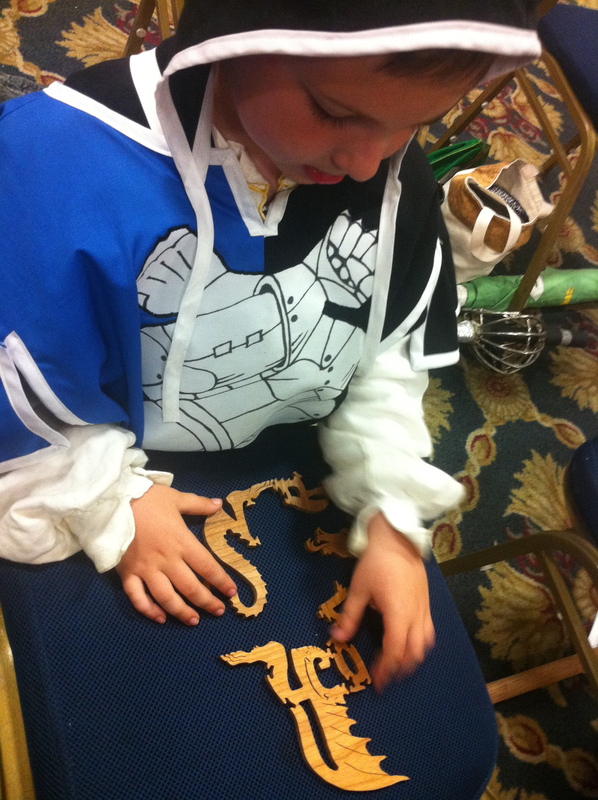 I, for one, am over the moon happy about discovering the SCA and experiencing it with my son in the Barony of Cynnabar within the Middle Kingdom. It gives us quality time together doing something we both enjoy, it educates and stimulates his young mind, it teaches him how to behave around adults, it helps his interpersonal skills with other children, and it makes him feel involved in something bigger than our small family. I encourage all parents and families to get your kids involved in the SCA! If you have questions about kids in the SCA, I’m happy to answer questions from a parent’s perspective, but please note that I am not a Youth Minister nor can I speak to SCA policy. Feel free to share this article with others (with proper attribution please). My son designed the backrest with the three circles and curved-top panels — I like how it looks similar but different from the other one. What’s left to do? Cut out the designs in the sides, woodburn a diamond symbol (my son’s choice) in the top circle, sand everything, and stain it. And I also have to do the same to my own. Oh! And my son asked for, get this, a cupholder. I’m thinking about that one. Alexander calls this the “Golden Path of Fire” band. I think it looks very nice!